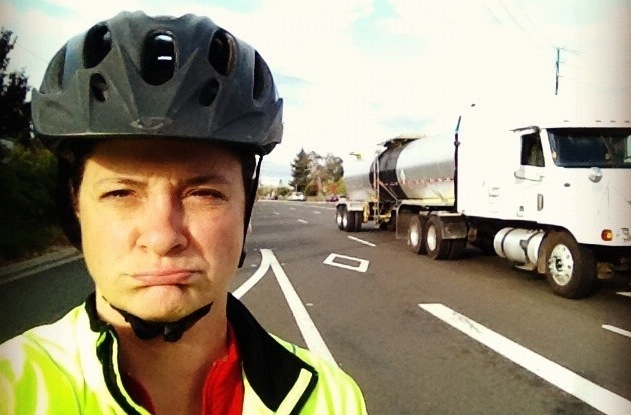 Bike Commute Diaries: I’m Not a Real Commuter | One woman. Many bicycles. I’m scared s*&&tless taking Central on those offramps. The traffic is getting so bad that I go faster than the cars. OMG yes! Those on/off ramps are frightening, especially between Mary and Bowers. The traffic was relatively light today at 8:30ish, probably due to the holidays so everyone was flying. I was totally deferential to the cars today since so many people don’t use signals. It’s probably much safer when the traffic is bad. Stay safe on those roads. Part of my commute has ‘National Speed Limit’ that’s 60mph on a single lane roads :-S When I drive on it, I do 45 mph tops because I know that cyclists use it. My strategy toward staying safe on those roads is (a) avoid them (b) treat the cars like wild animals and stay the hell out of their ways and (c) avoid them. Seriously, I won’t do this route again unless I really really have to. Central kinda scares me 😦 I actually don’t like it when there aren’t many cars because they can be faster on the more open road. My BF and a few friends of ours brave through Central as part of their prime commute. It is scary, and you’re right it’s worse when there are few cars on the road. They fly like it’s a freeway. I’ve been out there myself, rode from de la cruz to moffett blvd. a few times. it is a little nerve rattling at times. If a buffered bike lane could be put in somehow, that would probably make it a little more tolerable. Matt, the problem is that as you move further east/south, it’s built too much like a freeway. In Mountain View, it’s no different than riding Foothill Expressway. But once you’re in Sunnyvale, the sub-standard entrance and exit ramps make it impossible to engineer something better. My solution is to ride other routes, which works fine for me. Sorry you didn’t have a good time on Central Expressway, Janet. I bike commuted on Central to San Jose on the same day (Nov 20) for the same reason (Caltrain delays). I used to be terrified of Central Expressway for years but once I got used to it I enjoy riding it immensely – it’s fast and smooth. Of course I understand why most bicyclists avoid it – lots and lots of cars nearly all of them violating the speed limit and endangering their own lives and those of others. One has to maintain a rather high speed on a bike (20 mph) in order to minimize the time required to cross the “conflict zone” where vehicles are merging across the bicyclist’s path at the on-ramps and off-ramps. Santa Clara County allows bicycles to travel on all of its expressways, but provides the bare minimum accommodation for them – yellow signs with the bicycle symbol – on SOME of the expressways (including Central). Buffered shoulders and bike lane markings across the on-ramps and off-ramps would improve safety immensely, for both bicyclists and motorists. Has anyone spoken with County Public Works staff or the Board of Supervisors about this? I have not. Recently I’ve begun organizing recreational rides from Palo Alto to San Jose via Central Expressway. They’re called “San Jose Bomb” and we ride in a tight pack with bright lights (when at night) at rush hour down Alma Street in Palo Alto then Central Expessway all the way to San Jose. Our goal is to educate motorists as to our right to take the full lane (on Alma) and to ride on the shoulder of ALL Santa Clara County Expressways by being as many in number, as visible as possible, and following all sections of the California Vehicle Code pertaining to bicyclists. I post these rides when they occur at http://www.peninsulabikeparty.wordpress.com/calendar. An alternate route to San Jose from Mountain View is Evelyn Ave, Monroe St, Market St, Park Ave. We always take that route when returning from San Jose Bike Party. It does have some door-zone bike lanes, but because the vehicle speeds are lower, it’s much more suitable for less experienced or slower bicyclists than Central Expressway. That route could be vastly improved for motorists, bicyclist, and pedestrians with a 4-to-3 lane road diet on Monroe St, as was done previously on Evelyn Ave. Has anyone spoken with Santa Clara (the city) Public Works or with the Santa Clara City Council about this? I have not. I know plenty of people (mostly men) who are perfectly fine commuting on Central and appreciate having fewer lights. And I will support them completely in their right to use roads like Central. But it’s not for me–I can’t keep up 20 mph riding alone on a touring bike–and it takes the joy out of riding for me. I know plenty of alternatives, from the bay trail I usually take for the long ride to work to the modified Central route which uses Arques where available. My main point with this post is not that I’m a wimp, it’s that this type of commute is only desirable for a narrow segment of the population. Yet, this is what people think a “real” bike commuter is and it limits the ability of most people to even consider riding to work. Soooo…. what do you think of improving Central Expressway to accommodate more bicyclists? Should it be done? Are you interested in that? Any idea of how difficult it would be? Has anyone ever made such a request of Santa Clara County Public Works, or of the Santa Clara County Board os Supervisors? It wouldn’t be high on my list of projects, in part because I think it would be very difficult engineering wise and politically. I’d rather see sidewalks for peds first and focus bike projects on parallel roads where those are available. At this time, I’d only push on improvements to Central where it’s the only option (e.g. at de la Cruz entrance to SJC). The biggest problem w/ Central are the high speed merge zones in Santa Clara and Sunnyvale. Fix those, and Central will be a lot more like Foothill Expwy. I used to be the fearless go-fast cyclist down Central and would choose that route just for the thrill of it. These days I like the Bay Trail much more unless I’m in a hurry. Arques / Scott isn’t bad either. Yep, that’s the part I avoid–Mary to Bowers–where Sunnyvale put in all those lovely pseudo-freeway short merge entrance and exit ramps. They’re dangerous enough in a car must less on a bike. I definitely prefer the Bay Trail but will sometimes use Arques/Scott which has more lights but is lower stress. Problem with Arques/Scott is that to get to work I need to get on Central to cross De la Cruz to get into the airport. Not so bad eastbound, but westbound it’s a pain. I bike approximately 80-100 miles per week around SF and I too am not a real bike commuter. Not at all! I visited Portland Oregon back in Sept and rode on a couple of their “bike lanes” which offer an experience much like what you’re describing here – an on-again-off-again not-even-AASHTO-compliant shoulder/lane that would occasionally spontaneously disappear or become narrower than my handlebars… right up against 45-60mph traffic, which contained cement trucks, RVs, and all manner of death machines raging just millimeters from my elbows, causing my bike to wobble in the draft. It was a *total nightmare*. I couldn’t believe what some people (ODOTrs) are willing to throw a bike symbol on and describe on all the bike maps as a “bike lane”, but I was even more astonished to find how reluctant the locals in “bike friendly” Portland were to complain about such a ludicrously inequitable and obviously dangerous status quo. I was hard pressed to raise an eyebrow when I described my experience biking on these roads. Apparently this is “normal”. Goodness me I sure felt like a spoiled San Franciscan at that point, which is saying something, since I’ve been hit by 3 cars in 6 years of riding in SF. SF is no picnic either, but I do have a new appreciation for the table scraps we’re given in some parts of the Bay Area (obviously not Sunnyvale). I’ve definitely learned that I’m in the much talked about “interested but concerned” group of cyclists and not the “bold and fearless” category at all, despite all my daily biking. If the culture and infrastructure don’t change, the stress will eventually kill me if the cars don’t get to me first. Also: I love that photo! What a great shot. I just moved here from the east coast and haven’t ventured onto any of your express ways yet. Currently, my fastest route to work would be a six-mile shot down west San Carlos/Stevens creek, but I’m willing to take an extra few miles to ride up Park to Homestead. I would love to be comfortable riding on the expressways, but with the close calls I’ve already had near Stevens creek, I think I’ll pass. Anyone know if there are plans to add bike lanes to that section of Stevens Creek?